Are there genetically modified animals in the supermarket? Animal breeders have used selective breeding, a form of directed evolution, since animals were first domesticated. Using this approach, individual animals are chosen to be parents of the next generation because they exhibit a desirable trait or suite of traits that the breeder wants to keep, and perpetuate, in the population. In thinking about a Great Dane and a Chihuahua, it is clear that animal breeders have intentionally made dramatic genetic modifications to their common ancestor the wolf. Fig. 1. How Animals Are Genetically Modified? Breeders have used many tools such as herd recording, artificial insemination, genomic selection and embryo transfer to maximize the identification and use of superior parents and accelerate the rate of genetic improvement in food animal species, in some cases dramatically. For example, total annual per cow milk production in the U.S. increased by 369% between 1944 and 2007. At the same time, the number of dairy cattle needed to supply the US market decreased by more than 16 million. This reduced the greenhouse gas emissions associated with a glass of milk by one third relative to the 1940s. This emphasizes how genetic improvement of food animal species is an important component of sustainability. Technologies such as genetic engineering and genome editing are breeding tools that allow breeders to make precise, targeted changes in important traits using genetic variation that may not exist within the same breed, or even the same species. Genetic engineering typically involves the introduction of useful DNA sequences, sometimes recombinant DNA (rDNA), from other species and is commonly used in plants such as corn and soybean. The first genetically engineered animals were produced back in the 1970s and the first genetically engineered livestock in 1985. Yet, unlike plants, to date there are no genetically engineered animals available in U.S. supermarkets. The fast-growing AquAdvantage salmon was approved by the FDA in 2015, but is still not available in the US marketplace. It has, however, been approved and sold for consumption in Canada. Genome editing is a newer technology that employs the use of site-directed nucleases, i.e. molecular scissors, such as TALENs and CRISPR, which make a double-stranded break at a specific predetermined sequence in the genomic DNA. The repair of this break can introduce useful genetic variants into the genome. Often these variants involve no introduction of novel rDNA sequences, but rather mimic the genetic variation that follows natural genome repair processes which are the basis of selective breeding. 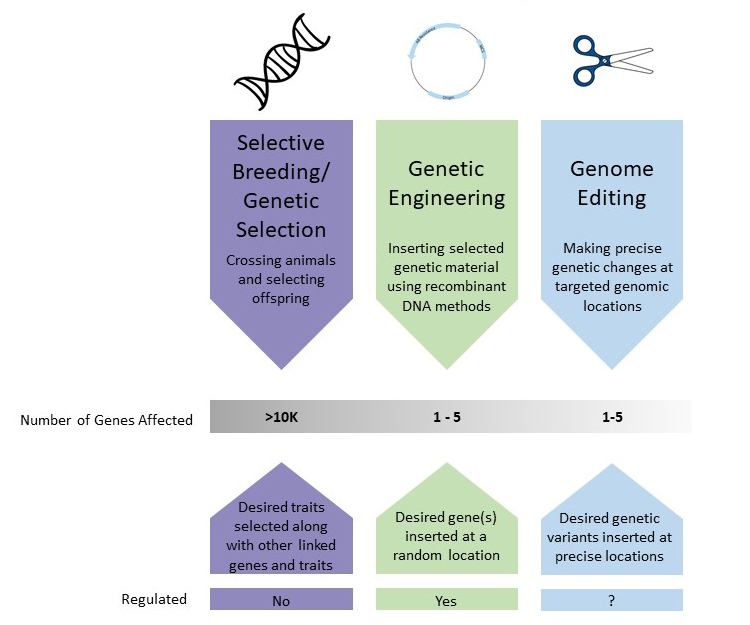 Gene editing has been used to correct genetic diseases and disorders, improve product yield, and target traits associated with animal health and welfare. For example, gene editing was used to produce dairy cows that genetically do not grow horns. This spares them the uncomfortable process of manual horn removal which is typically performed on calves to protect them and their human handlers from goring. Although animals bred through the use of conventional genetic selection are not regulated, genetically engineered animals are regulated globally by several agencies. The regulatory status of genome edited animals, however, is currently unclear. Genome editing does not necessarily introduce rDNA from other species and many of the changes produced are indistinguishable from naturally-occurring genetic variants, meaning that they would not fit the classical definition of genetic engineering. Regulation of genome edited animals will likely be considered on a case-by-case basis but it is important to ensure that the regulatory oversight is proportional to the unique risks associated with the resulting animal, if there are any, and also adequately weighs risks against potential benefits. If these animals are regulated differently around the world, it will be difficult for breeders to use these technologies to achieve important breeding objectives. Genetic modification of food animals.